If the terminally dull layout hasn't already caused you to nod off, pour yourself a cup of coffee and stick with me. 1. The background: More accurately, the complete absence of a background. Granted, lots of background detail isn't essential for a dramatic cover, but in this case, some would have helped. The flat gray and pale blue color fields give no sense of place, scale or spacial relationships. 2. "Junkman": Besides being one of the worst-designed characters I've ever seen, Junkman is also so awkwardly posed, it's not entirely clear what he's doing, or what his intent is. Is his foot recoiling from Superman's exploding midsection...or is he mercilessly stomping Superman's groin? Most likely the latter, but not as clear as it could have been. 3. Superman: One of the few bright spots of the cover, obviously drawn by Bob Oksner. Shockingly, the entire cover is credited to Bob, but knowing what I know about his skills as an illustrator, I find it hard to believe. But, everyone can have an off day, and maybe this was one of his. 4. Logos: Could there be more confusion on the use of logos on this cover? 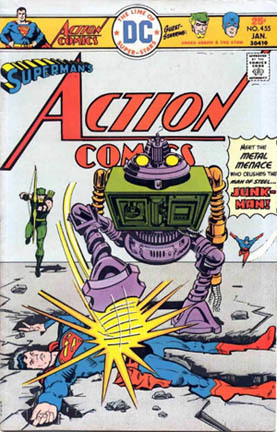 We've got the large Action Comics behind Junkman (with enough space above it to fly a 747 through), a tiny Superman logo sloppily intersecting with it, and yet another Action Comics logo stuck into the masthead. 5. Green Arrow and the Atom: Wow. Some horrible positioning here. It's not entirely clear if they're even aware of the stomp-assault on Superman's groin, since no word balloons or facial expressions convey any sense of urgency or alarm. True, Ollie's got his bow drawn, but it seems to be pointed more toward the reader than Junkman...while the Atom appears to be...flying??? (as the tiny drop shadow indicates). 6. The coloring: The muted, low-contrast color pallette was an unfortunate hallmark of mid-70's DC Comics covers, and this issue was no exception. The pale gray, blue and yellow combined with Junkman's mishmash of drab secondary colors (orange, green and purple) provide zero impact and excitement. From top to bottom, this cover strikes out...which is probably why I haven't gotten around to buying it for my Action Comics collection, despite having had a few opportunities to do so. I'm not sure if I'd even be willing to pay the 25¢ cover price, much less the $3 to $5 a dealer would charge for this dog. Well, that wraps up this week's Worst Cover Ever. I'm open to suggestions for future candidates, so drop me a line (or leave a comment) if you've got a contender. 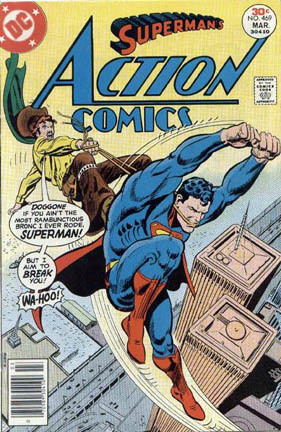 This week, the honor of the Worst Cover Ever distinction goes to Action Comics #469 (1977). Here we find Superman enduring the most humiliating experience of his long history as Terra Man, a villainous space cowboy (yes, a space cowboy) attempts to "break" the Bronco of Steel. I can't decide which is more disturbing: the wince-inducing visual or Terra Man's "doggone, if you ain't the most rambunctious bronc I ever rode" line. I know images like this aren't supposed to alarm us in this sensitive, post Brokeback Mountain world, but doggone if that ain't messed up somethin' fierce! WA-HOO! Another week, another worst cover ever...and this one's a doozy! Starting as early as the 1940's, comic book companies experimented with mixing real world photographs with comic book characters, getting results that (perhaps even at the time) looked a little strange. Part of the problem was that the image reproduction technology was still fairly crude, creating "special effect" covers that weren't particularly special OR effective. Though obviously intended to be a cozy, heartwarming scene, a whole host of factors conspired to made it simultaneously one of the most boring and bizarre covers of all time. A blank white background with all the homespun warmth of the Phantom Zone. Cap's freakishly deformed right hand (holding the unusually large infinity cover comic book). The garish "hand-tinted" coloring effect on the children. Apparently, the kids were the grandchildren of award-winning DC colorist Jack Adler. "Hey, grandpa, thanks for the sickly pea-green nightgown!" The boy's wince-inducing helmet hair, triggering far too many painful flashbacks of my grade school photos. 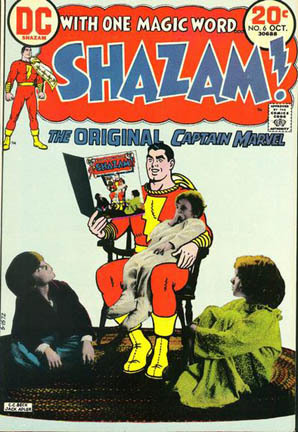 The eerie, corpse-like pallor of the child slumped in Cap's arm, a tragic image oddly disconnected with Cap's big, squinty grin. Add to that the child's huge, clown-like feet and it's safe to say that whatever look they were shooting for here....just didn't happen. 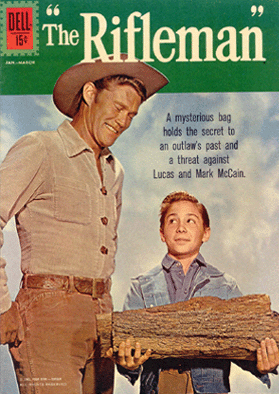 By the way, is that a shadow from the log, or did Chuck Connors wet himself? Click here for more Worst Covers Ever! This week's big loser is the cover of Detective Comics #279 (1960), a glittering treasure-trove of wrongness. First of all, the dreadful character design of the "weird creatures". If the intent was to strike fear into the reader, Rosie the Robot's taller sister and a bright pink cat-cow hybrid aren't cutting it. At a time like this, should Batman's primary concern really be the sanctity of their secret identities... or should he...oh, I don't know...be trading the test tube for a Bat-Bazooka? Besides, if Tall-Rosie and the Pink Cow know their secret identities, who are they going to tell? A terrified press corps running for their lives? A shrieking Commissioner Gordon hurling his emptied service revolver at them? Who? How exactly would these creatures "stalk" Batman of all people? Park outside Wayne manor in a non-descript car wearing sunglasses while reading the newspaper? Admittedly, it was a tough assignment to help Batman weather the raging sci-fi fad of the late 50's and early 60's, but I can't be the only one to see just how far afield the Batman books had strayed from their dark, gothic beginnings. Covers like this emphasize how truly lost the character had become during this loopy era, forcing Batman into situations that were equal parts hilarious and humiliating. 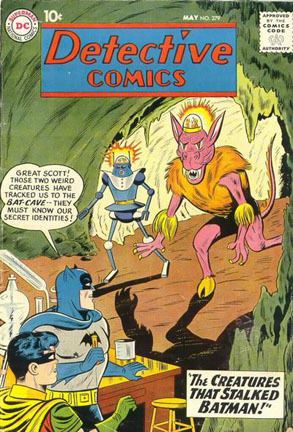 Even though it's a bit of a cheapshot to nominate a Golden Age cover for W.C.E. (considering the much lower production standards of that era), the cover of Green Lantern #22 (1946) was clearly asking for it. 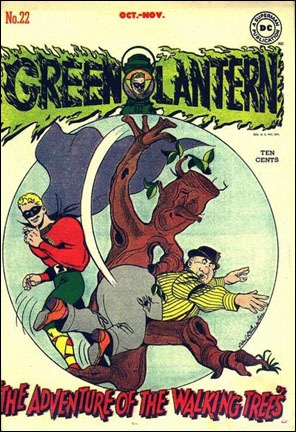 Here we see a sentient tree giving Green Lantern's sidekick Doiby Dickles the walloping of his life, while G.L. smirks in the background. Granted, his magic ring was powerless against wood, so there wasn't much Green Lantern could do to help Doiby...but you'd think he could at least muster a little concern for his helpless pal. Maybe his massive, mutated left arm is making him a little giddy. I think what bothers me the most about the cover isn't so much the scene itself, but rather the larger Golden Age trend of DC attaching dopey comic relief characters to otherwise cool, immensely powerful characters. In addition to Green Lantern's Doiby Dickles, the original Flash (Jay Garrick) was stuck with The Three Dimwits (a.k.a. "The Three Idiots" or "The Three Numbskulls"). Imagine....the Fastest Man Alive, forced to play straight man to Winky, Blinky, and Noddy for dozens of adventures. Worse by far was supernatural powerhouse The Spectre, formerly the vengeful agent of The Voice (God), reduced to playing "guardian angel" to Percival Popp, the Super Cop. So, yeah....seeing Doiby Dickle's fat backside getting paddled by a jolly tree is bad enough...but added to the larger trend of handicapping otherwise cool characters with clownish sidekicks, it's easily one of the Worst Covers Ever. If it were possible, how would one improve upon a classic supervillain like The Joker? I'll give you a hint: Don't give him a flame-throwing banjo! That's exactly what I.W. 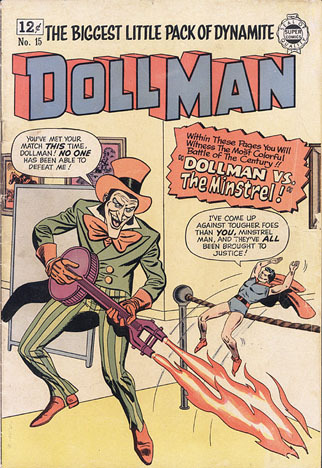 Publishing did in Dollman #15 (1964), with a Joker-wannabe named "The Minstrel". Mix in a hideously drab color scheme, a layout that could put even Robin Williams to sleep, Dollman's bare legs and little red booties, and you've got yourself a prime candidate for this week's Worst Cover Ever...despite the Seal of Quality in the upper-right corner trying to convince us otherwise. During the fever-dream that was editor Eddie Berganza's reign on the Superman titles (1999-2006), there were a number of clueless moves on Eddie's part that are now the stuff of legend among long-suffering Superman fans. From accepting low-wattage, sub-par writing to the introduction of wonky Manga-esque art styles, it seemed to be a never-ending parade of disappointment under Eddie's not-so-watchful eye. Superman ponders, "Did I leave the iron on?" What would possess someone to approve that hideous trade dress at the top of the cover? An indistinguishable blob of a Superman logo (with the "S" symbol at the end making it read as "Supermans") coupled with the decision to run a dreary poop-brown background behind it is "Classic Eddie". Of course, the worst part of this hideous cover is the dreadful image of Superman himself. What better way to celebrate a milestone anniversary issue than to completely mock the character you're celebrating? Well, that seemed to be what Eddie had in mind when he hired caricature artist Dan Adel to paint this steroid-soaked doofus of a Superman. If I'm looking for a guy to do a wacky shot of Drew Carrey holding a pen, I'll hire Dan Adel....but for Superman #600? Not a chance! 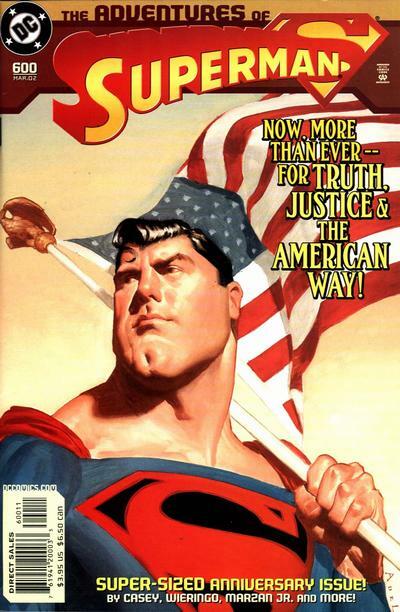 Oh, I'm sure the sophisticated Cool Cats of the Rolling Stone Magazine set enjoyed the cover's air of delicious irony, since the patriotic sentiment looks as flat-out foolish as Superman himself. But as for Superman fans at the time, it's fair to say most of us were pretty disappointed. The story inside was predictably underwhelming as well, which makes Adventures of Superman #600 the poster child for Eddie Berganza's titanically disappointing stewardship of DC's flagship character. I realize making fun of Rob Liefeld art is as easy as shooting fish in barrel, but the enormity of this crime against humanity compels me to speak! First, some brief history. Rob Liefeld burst onto the comics scene in the early 90's as the artist of DC's Hawk & Dove. Following a popular run on Marvel's X-Force, he then formed Image Comics with a gaggle of fellow "hot creator" rock stars. In 1996, Liefeld and fellow hot-shot Jim Lee were contracted by Marvel to "reimagine" some of their struggling titles. Jim Lee got the Fantastic Four and Iron Man, while Rob the Boy Wonder got The Avengers and Captain America. Despite respectable sales numbers (which the hype all but guaranteed) Jim Lee's titles had a lukewarm reception among fans, while Liefeld's titles became an instant laughingstock throughout the industry. While never a strong penciller in the classic sense (or any sense), it was obvious Liefeld's style had further deteriorated, going places physics and human anatomy had no business going (see the above inset of the costumed Cap). It should come as no surprise that Marvel pulled the plug after only 6 issues of Liefeld's 12 issue contract. 1. How big is that kidney stone Steve Rogers is trying to pass? 2. What's that nasty rash or vascular disease ravaging Steve's neck and shoulder area? 3. Why is Steve's nose thinner than Michael Jackson's? 4. Is that a bird's nest on Steve's head? 5. Who's the random female face floating in mid-air? 6. Whose arm is that below the woman's face? 7. How did Steve jam the heel of his left shoe so far into his nether regions? 8. Can fancy digital coloring cover up poor drawing? 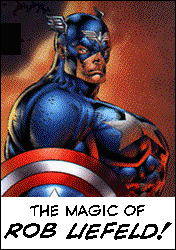 As Cap's shield makes abundantly clear....no. 9. Is Nick Fury's eye-patch strap actually a piece of black thread? A gossamer strand of a spider's web? A human hair? 10. Most importantly: who actually bought this issue? Well, you get the picture. Like I said, I feel a little guilty going after Rob (since he seems to be one of fandom's favorite pinatas), but man alive, this is some lousy work. In fact, all comic book artists need to keep this Rob Liefeld cover posted near their drawing table, and anytime they're tempted to slap out a sub-par cover, take a look at Captain America #2, sharpen the pencil, sit up straight and get back to work. Do it for Cap. Do it for your country, soldier! 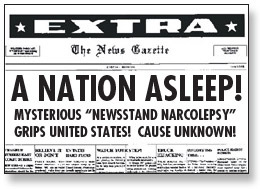 One of history's most enduring mysteries has been The Newsstand Narcolepsy of 1963, as thousands of newsstand customers across the nation suddenly collapsed into a state of deep sleep. When the victims were finally roused from their slumber, none of them could remember what triggered their instantaneous sleep. After doing a little detective work, I think I've finally solved the mystery. Warning: You may experience drowsiness or sudden, unexplained sleep. Do not drive or operate heavy machinery while viewing the following cover! The Amazing Spider-Man #10: The Dullest Cover Ever Created. Against the vacant, lime-green background, the already underwhelming threat of The Enforcers (basically throwbacks to the gangster archetypes of yesteryear) is made even less compelling. Add to that Spider-Man's kinda goofy, distorted anatomy and the bland-as-bran lettering, and it's easy to see how unsuspecting newsstand customers could have been instantly bored to sleep when catching a glimpse of this cover. 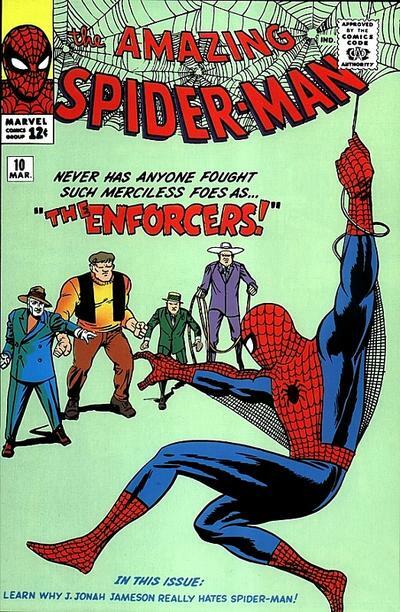 Believe me...I'm a big fan of cover artists Jack Kirby and Steve Ditko, but the example above can certainly be considered one of their rare strike-outs. 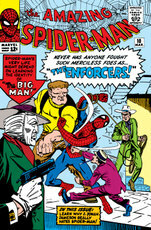 Making the publication of this cover even more troubling was the discovery of an alternate, and far superior cover design by Steve Ditko (click on the image for a larger view). As you can see, the alternate cover design is much more dramatic and interesting. Better yet, the story's central mystery, the true identity of The Big Man, received the thematic attention it deserved by placing the masked mastermind (as well as a huge red arrow pointing him out) front and center. While the background is still a bit on the spare side, we're at least given some idea of context and setting in this version. In every respect, this cover design trumps the actual published version...and I'd love to find out why it ultimately wasn't chosen by Stan the Man. Anyone happen to know? Well, whatever the story was behind the two versions of Spider-Man #10, it seems the case of The Newsstand Narcolepsy of '63 has finally been cracked.